Chandra paced back and forth on the loose dirt near Karn's crater, waving her hands. "Are you kidding me? You've been lying all this time? Why?" They were surrounded by piles of smoldering trees and pieces of wrecked automatons, the air heavy with smoke. Furious, she faced Luti. Or Jaya. Or whoever this was. "Why would you do this to me?" "Not everything is about you, Chandra." Jaya was annoyingly calm. Chandra seethed. She really wanted to set something on fire, but had just enough control of her temper to know that would be a bad, bad idea. "So what were you doing in Keral Keep, then?" Jaya looked amused. "I didn't go there for you, believe it or not. I was there years before you showed up." Chandra set her jaw. "Pretending to be Mother Luti? Why?" Jaya sighed. "A long time ago, I went to Regatha, helped a few people, got drunk, talked a lot, apparently did some very impressive pyromancy, then left. Two hundred years later, I went back and found they'd started a religion based on me." She folded her arms and admitted, "It was all a little embarrassing, frankly." Karn looked from Chandra to Jaya and back, and then clearly decided this was not an argument he wanted to be involved in. He turned and strode back toward the crater, the surviving automatons clanking after him. Chandra pressed her hands to her head and tried not to pull her hair out in exasperation. "Then why go back at all? Why stay at Keral Keep pretending to be somebody else?" "I didn't want to be a religious icon, but I had to make sure they weren't misrepresenting me!" Jaya said, as if it was obvious. "And I thought I owed them a little guidance. Where do you think the monastery kept getting those 'long-lost writings of Jaya Ballard' from?" Jaya laughed. "Oh, don't look like that." She sighed and her expression turned serious. "I felt guilty. I never meant them to take me that seriously, but there they were, years later, treating me like an all-knowing deity. But I liked the work they were doing, helping young pyromancers. I'd been aging for sixty years, and I wanted to do something worthwhile for what was left of my life." She eyed Chandra. "You have some idea of how hard it can be to help those kids. They're impatient, reckless, refuse to listen to anyone . . ."
Chandra let her breath out. She was still mad, but this was starting to sound almost reasonable. She wasn't sure what she would have done in Jaya's place. I wouldn't have lied about who I was for years, she thought sourly. She was pretty sure she wouldn't. Though being worshipped like a god was sure to get old fast, considering how long Chandra had lasted just as abbot. But maybe it didn't matter. Her plan was still intact. She'd found Jaya, and now she could get the help she needed. "All right, so . . . I understand why you did it, mostly. I forgive you." She held out Jaya's goggles, though the gesture was mostly symbolic now. It wasn't like Jaya couldn't have gotten them any time she wanted over the past years. "And now I'll let you tell me what I need to know to be a more powerful pyromancer." Jaya took the goggles, and her expression turned hard as stone. "Absolutely not." The next morning, Chandra woke up in the little tent she'd set up on the far side of the crater. For a moment she thought she was still on the trail through the ridges, filled with hope and excitement about finding Jaya Ballard. Then she remembered where she was and what had happened. She put her hands over her face and groaned. She had spent the rest of yesterday arguing with Jaya. Chandra had tried to tell her about Nicol Bolas and how she needed more power to help defeat him. Jaya had not been impressed with her explanation and had said again that Chandra should have stayed with her friends. "You said that at Keral Keep when I was getting the goggles," Chandra had pointed out. "When you were pretending to be Mother Luti." "Right, when you yelled in my face and then disappeared," Jaya had replied, with an expression that should have withered Chandra where she stood. "Or was that some other time you yelled in my face and disappeared? It happens so often, all the occasions blend together!" After that there was a lot of Chandra shouting and Jaya mostly ignoring her. The last thing Jaya had said to her had been, "When I was Mother Luti, you dismissed me as a useless old woman. As Jaya Ballard, suddenly I'm worth listening to." Now Chandra was tired of being angry, but she couldn't give up. She didn't know what else to do. I have to convince her to help me, Chandra thought. There was no other option. Maybe this morning she's changed her mind. She crawled out of the tent into the bright morning light. The deep green forest surrounding the valley was still stationary, but the shadows under the trees were vaguely threatening. The piles of wood had mostly stopped smoldering and the morning breeze carried the smoke away. Jaya was on the far side of the pit, standing on a mound of dirt, facing the forest as she kept watch. Karn stood nearby at the edge of the crater, which looked much deeper than it had yesterday. Some automatons stood guard at the other end of the valley, but most were down in the pit, digging with their scoop-like hands or carrying dirt to the piles. The automatons had been digging all night; Jaya had put some fireballs in the air to light the area for them. As Chandra wandered along the rim, she saw it was full of weird broken metal shapes and blocks of stone. Karn watched her approach, his metal features sober. "Are you all right?" he asked her. His voice was deep and reverberated just a little, like someone speaking inside a metal room. "Sure, I mean . . ." Chandra shrugged. "You always spend half the day shouting?" Karn's tone was wryly amused. Chandra looked toward where Jaya stood on the mound of dirt, keeping watch. "And Jaya came to help you?" "Yes, to help protect the excavation from Multani's attacks. In his semiconscious state, he senses that the Cylix is being uncovered, brought closer to the surface, and he fears it. For good reason; it caused great damage to him." Karn looked off toward the forest, where the morning wind stirred the tree canopies. "He does not want Dominaria harmed again. When he wakes, he'll understand that I'm taking it away to end the Phyrexian threat." That sounded important, and Chandra didn't want to interrupt. "I'm going to talk to Jaya again." Karn looked down at her, his metal brows lifted. "Must you?" Chandra bit her lip. "I have to change her mind. I need someone to help me learn the secret to becoming a more powerful pyromancer. It took me a long time to realize it, but I understand that now." Karn sighed. "I see. Good luck." "Thanks." Chandra walked around the crater to Jaya's mound of dirt and climbed to the top. Jaya didn't acknowledge her. Chandra scratched her head and said, "Look, I guess I just don't understand why you won't help me. This is what you said you wanted all this time." Jaya's expression was cold. "Exactly. You had more chances than I can count." She shook her head like someone who was absolutely done with this argument. "I used to be just like you, Chandra. That's why I thought I could help you, but maybe we're too much alike. You told me on Regatha that you didn't want my help, and that's that. I'm not offering again." "Yes, but . . ." Chandra trailed off. That was when she had thought Jaya was Mother Luti, an old woman not worth listening to, which was exactly what Jaya had said yesterday. I really screwed this up, she thought. If she had listened to Mother Luti, tried to be less impatient, Jaya wouldn't be so fed up with her. "But I really need help—"
Jaya turned to face her, annoyance written on her features. "I've told you everything you need to know already. There's no secret. To master your power, you need to know what you want, know your true self. You have no idea what you want." Chandra set her jaw. "I want to kill Bolas. It's that simple." "Then why are you here with us instead of your Gatewatch friends?" Jaya's voice was harsh with frustration. "For the last time, Chandra—"
A loud crack made them both spin around. Karn, on watch on the far side of the crater, turned and leapt into the pit. Jaya jumped down from the mound and strode to the edge. Chandra followed her. Down in the pit, the big automatons had stopped digging and stood around a broken stone slab still partly covered by dirt and gravel. They moved aside as Karn approached. He knelt in the churned-up dirt and carefully moved sections of the slab aside, then leaned down to brush at something beneath. After a moment, he sat back, looked up at Jaya, and nodded once. "He's found the Cylix." Jaya let her breath out, but she didn't look relieved. "That's good, right?" Chandra said, confused. "That's the bomb thing he's going to take to another plane and kill the Phyrexians with, right?" "Yeah." Still watching Karn, Jaya shook her head a little. "Everyone I've talked to thinks the Phyrexians aren't a threat anymore, but . . . He needs to do this. I just wish he didn't." Chandra frowned. "They destroyed a whole plane, so why is destroying them a bad thing?" The problem with interplanar threats was that by the time you realized you were in danger, it was generally too late to do anything about them. Or that was how it had worked with Bolas on Amonkhet. "Because it means he'll have to go back there." Jaya grimaced. "And that could be a disaster for a number of reasons." Then she glanced up and her eyes widened. "Oh, damn it! Karn, they're coming!" Chandra looked. The treeline roiled with motion. "I hate these things," she muttered. And it looked like there were a lot more of them this time. Trees rose out of the forest, the giant striding ones and the spidery creepers. They rolled toward the crater in an angry wave of leaves and branches. The automatons scrambled toward the sides to climb out, but there were too few of them to defend the site. Karn was still trying to get the Cylix out from under the slab and they had to give him time. Chandra shouted, "Jaya, you take that side, I'll go this way!" As Jaya ran, Chandra circled around in the other direction toward the approaching trees. When she reached the right range, she planted her feet, took a deep breath, and sent fire streaming forward. She blasted the first line of trees, then flung fireballs over their burning canopies to hit the newcomers surging out of the forest. She heard Jaya on the far side of the crater, striking the trees with a barrage of targeted blasts. Out of the corner of her eye she saw that Karn's automatons had managed to climb out of the crater. They threw themselves at the walking trees and punched into the trunks or ripped at the roots. Except more trees came, and more, and more. They were desperate to get to Karn and the Cylix. If they reached him, they'd tear him apart. Chandra kept up the fire streams, digging deep for her power and yelling until her throat was dry and hoarse. The valley filled with smoke and fire. Finally there were no trees charging at her and Chandra staggered to a stop, wiping sweat off her forehead. As the smoke cleared, she saw pieces of Karn's automatons everywhere. It didn't look like there were any survivors. Jaya had been pushed back toward Chandra and stood only a short distance away. Chandra realized she had been unconsciously backing up too, that the edge of the crater was now only a few feet behind her. She said to Jaya, "Where's Karn? We have to get out of here!" Jaya squinted, trying to see through the haze of smoke. "I lost track of him. I hope he's not in pieces—oh, that's all we need!" Chandra whipped around again and thought, It's worse. 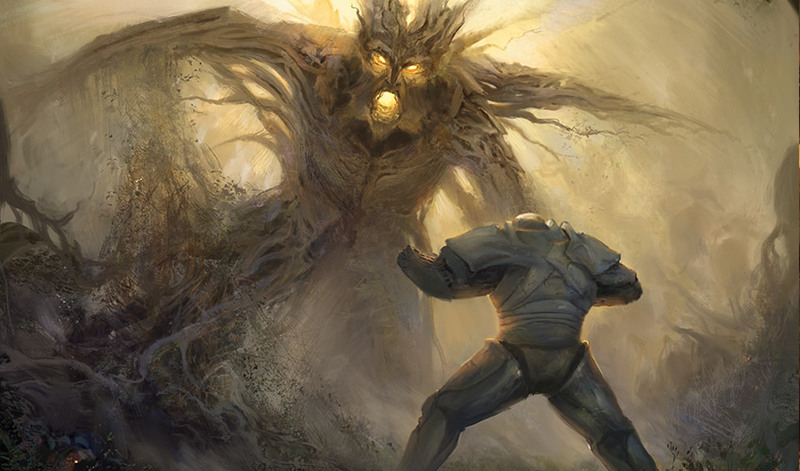 Rising above the tree canopy was a giant made of roots and branches, its eyes and mouth glowing with yellow light. Its head was jagged on top, the wood shaped into horns, or maybe the remnants of a pointed crown. Chandra said, "What's that?" "I'm pretty sure that's Multani, or what's left of him," Jaya said grimly. "Karn, damn it, where are you?" A pile of smoldering wood near the crater tumbled over as Karn pushed his way free of it. He had something tucked under his arm and his metal body was covered with dirt and soot. As he looked up at Multani, his expression was more sad than angry or worried. "He's still semiconscious. He would never hurt us if he were himself." Multani pushed forward out of the forest and stepped onto the bare scorched earth. He kicked the mounds of broken and burning trees aside as he strode toward them. All around the valley, more animate trees burst out of the forest to gather for a charge. Chandra braced herself. "We can hold them off!" "We'll have to." Jaya's gaze was determined. "Get ready." Then Multani stopped. Chandra frowned, thinking he was somehow readying himself for an attack. But Multani didn't move. None of the trees moved either. Chandra took a wary step forward. "What's he waiting for?" Jaya straightened up slowly. She pulled her goggles off to squint at Multani. "Look at the forest. He's frozen." Karn's metal brow was furrowed. "It's time magic." "Huh?" Chandra said, baffled. Then she realized the leaves and branches of the stationary trees back in the forest moved slightly in the wind, but Multani and his animate trees were as still as stone. Jaya was right; they had all frozen in place. Then a shadow fell on the ground around them. Startled, Chandra looked up. Overhead was a long narrow shape, like the underside of a sailing ship. It was the underside of a ship—a skyship. Jaya climbed a mound of dirt, shading her eyes to gaze up at it. Chandra ran to join her. From this angle she could see the bow, where a man in flowing blue robes stood. He held out his hands, obviously performing a powerful spell. Karn was looking up with an expression of wonder. 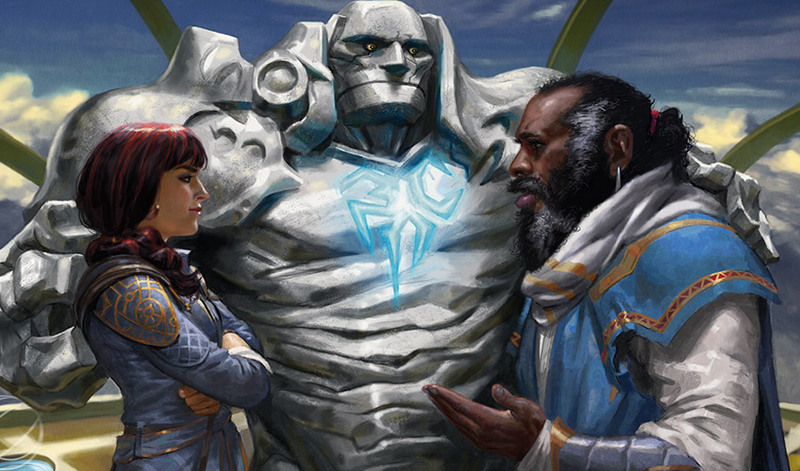 "This is the Weatherlight, and that's Teferi." He shook his head. "I wasn't expecting this." "A time mage with excellent timing." Jaya smiled. "Right, but what's—" Chandra started to ask. Then someone leaned out over the railing to unroll a boarding ladder, and with a shock, she recognized him. "Gideon!" She waved wildly. "Hey, Gideon, what are you doing here?" Liliana stood beside him, looking annoyed. "Chandra?" he called back. "Quick, all of you come aboard. He can't hold it for much longer!" Jaya caught the end of the ladder as it swung toward them and held it out to Chandra. "Here, you go first." But Chandra looked back at Multani. Karn had said he was semiconscious, that he would never do any of this if he was awake and aware. She didn't want to leave him like that. And she thought she knew a solution. "No, you two go. I want to try to fix this." "Fix it?" Jaya asked, startled. "How?" "Something a friend of mine showed me." Chandra started down the hill. She wasn't sure if she could do it for somebody else like Nissa had done it for her, but it was worth a try. It just wasn't fair, or safe for anybody living near here, to leave Multani like this. "I've got to give him a chance." She picked her way over the broken wood and the piles of dirt and debris, until she stood just below Multani. She didn't know how long she had, how long the time mage could hold Multani still, but she couldn't afford to rush, either. She said, "I know you can hear me. I know you don't want to be like this, you don't want to hurt people. That's not what you are. Think about water, still cool water. Flowing over your skin, your bark, into your branches and leaves. You're a light, floating on that water." Just saying the words like Nissa had, visualizing them, made Chandra feel calmer. I miss her, and I don't know if I'm ever going to see her again. Chandra imagined the light floating on the water herself and let her emotions still into a calm sadness. She remembered what Jaya had said about knowing your true self and added, "I know you don't want to hurt anyone. Sink into the water, find your true self waiting there. Remember—remember who you are . . ."
Time seemed to slow, and Chandra drifted on it like a light herself. After arguing with Jaya and being attacked by trees for most of the past two days, it was a relief. Then she realized Multani, too, was changing. The ashy bark of his skin turned darker and richer, and green plants sprouted along the tops of his hands and arms, running up to his back, up to soften the wooden crown of his head. Flowers in a whole riot of colors appeared in the green, their petals unfurling. The angry gold light from his eyes and mouth faded to a deep blue, and she was sure she saw awareness there. All around him, the roots of the animate trees sank into the disturbed earth. Chandra backed away, just in case she was wrong, and then called over her shoulder. "Let him go!" There was a hesitation, then a wind scented with smoke and burning washed over Chandra, as if it had been frozen too. Multani looked down at her, then at Karn. He said, "You have the Cylix." His voice was deep and low and had an undertone like wind rushing through leaves. Karn moved forward to stand beside Chandra. "I will take it to New Phyrexia. It will never harm Dominaria, I swear it." Multani relaxed, his body becoming less stiff. The animate trees were rooted to the ground in the valley, like they had always been here, shading the burned earth around the crater. Multani looked up at the Weatherlight then, and frowned. "You used Molimo's seed?" 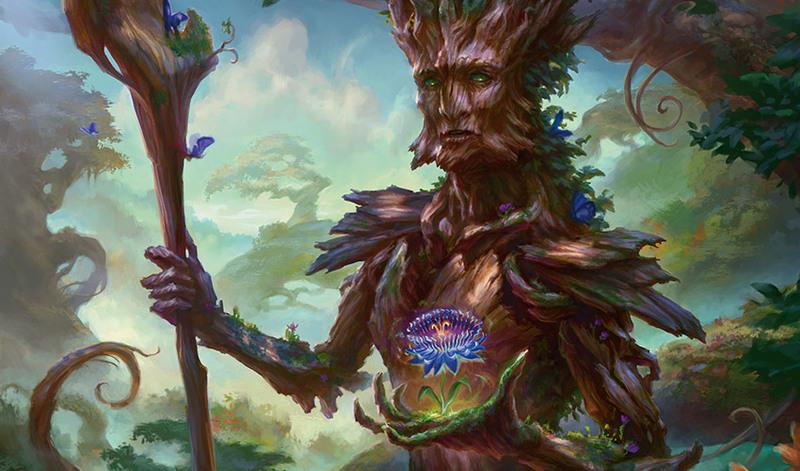 "His rival, another tree elemental," Jaya answered, suddenly beside her. She added, "That was good work." Chandra grinned in spite of herself. "A friend of mine showed me how." She hesitated. After calming Multani, she felt pretty calm herself, and everything seemed a lot more clear. She'd been rude and dismissive to Mother Luti, and just as reckless and impatient as any other young pyromancer in Keral Keep. "I don't want to fight with you, Jaya. I'm sorry about how I treated you and I understand why you don't want to help me. I wouldn't want to help me, either. But I hope we can still be friends." Jaya eyed her, a small smile tugging at her mouth. From the bow of the skyship, Gideon shouted, "That was impressive, Chandra!" He said something to Liliana that Chandra couldn't make out, but she heard Liliana's reply: "I'll tell her she did a good job if she gets on the damn skyship before we all die of old age." "Those are my friends," Chandra explained to Jaya and Karn. She called up to the Weatherlight, "What are you doing here?" "The same thing we were doing when you ran away," Liliana said. "Planning to kill Belzenlok." "I didn't run away! I was trying to—" Chandra hesitated. "She came to find me so I could help her to better master her pyromancy," Jaya called up to them. She waved at the smoking battlefield around them. "We've been getting some practice, as you can see." Chandra turned toward her. "Really? You mean—"
Jaya clapped her on the shoulder. "Yes, really. You're not there yet, but what you did with Multani shows me you have potential. Now come on, let's get out of here." As Karn and the two pyromancers climbed the ladders to the deck, Jhoira told Tiana, "Take the wheel. I've got to convince two very stubborn people of something and it may take some time." Tiana smiled wryly. "Good luck." Jhoira took the stairs down to the open deck. Karn stood a little apart from where the other Planeswalkers were talking. Jhoira knew him well enough to see the uncertainty in the angle of his body, and wondered what it must be like for him, to suddenly be standing on the Weatherlight again after so long. Teferi strode up to him. "Karn, my old friend!" He clapped Karn on the back, causing a faint clang. "We're glad you're back with us!" "I'm glad for your arrival—" Karn began. Karn sighed. "You haven't changed." Then he turned and saw Jhoira. She smiled. Gideon and the others were going below, and she waited until they were out of earshot before she said, "It's been so long." Karn took a hesitant step forward. "Jhoira, I must tell you—"
"About Venser? I know." She closed the distance between them and put a hand on his arm. "Ajani Goldmane came to tell me. Teferi knows, too." Karn regarded her in silence. "I regret . . . I would not have chosen for him to sacrifice himself for me." "But it was his decision," Jhoira said firmly. That was one thing she was certain about. Karn looked from Jhoira to Teferi, hesitating. "So we are back aboard the Weatherlight. What is our purpose here?" "First to destroy Belzenlok, then to defeat the Cabal," Jhoira told him. "That's why I had the Weatherlight reconstructed and recruited a crew. But I had something else in mind for you two." 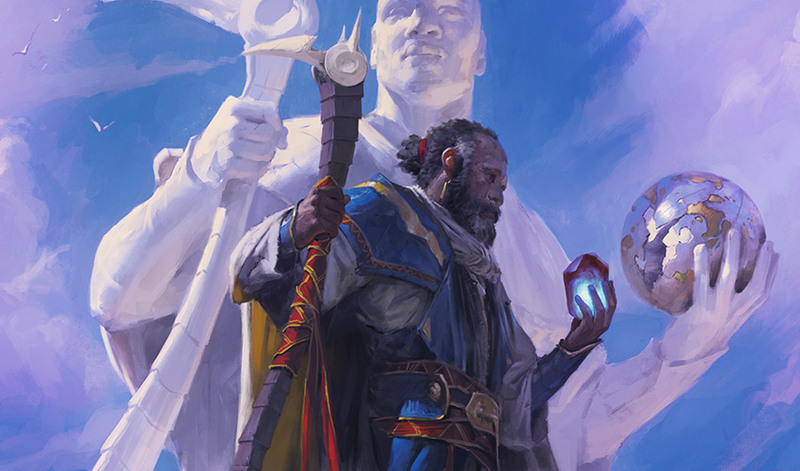 Teferi leaned on his staff, smiling a little. "I'm not surprised. You always have a plan." "I have the Cylix, to destroy New Phyrexia." Karn lifted a bag thick with padding. "That is my plan." Jhoira wasn't surprised Karn was still focused on the Phyrexians. Among all the other reasons, he would want revenge for Venser. "And it's an admirable cause, but before that, I think you should help kill Nicol Bolas." Teferi lifted his brows. "Karn could help. But you forget, I'm no longer a Planeswalker. Unless Bolas comes here . . ." He trailed off as Jhoira lifted her pendant and opened it. His eyes widened. "I'd never forget that," Jhoira said, watching him gravely. The Powerstone in the locket was reflected in Teferi's eyes. He had recognized it immediately, felt its call to him. Karn leaned forward to look. "It's your spark?" Teferi's brow furrowed. "How?" he said. "The Mana Rig." She held it out to him. "Will you take it back?" Teferi pressed his lips together and stepped back. He looked away, frowning. "You ask a lot of me, Jhoira." Jhoira wasn't daunted. She had known this wouldn't be easy. "Do I? Isn't this what you want?" Teferi shook his head and looked away, and Jhoira's frustration boiled up. "Do you know what I'd give to be a Planeswalker?" That got Teferi's attention. He faced her, his expression grave. Jhoira took a sharp breath and said, "This is a precious gift. Don't throw it away." Teferi was silent for a long moment. Then he said, "I'll think about it." He let his breath out, and smiled at Karn again. "But for now, we're just three old friends, with a great deal of catching up to do." Jhoira didn't object. She knew Teferi too well. As the Weatherlight sailed over Yavimaya, Gideon told Chandra about their plans and what they had accomplished so far. They were sitting with Liliana and Jaya around the big table in the compartment below the bridge. As he finished, Chandra said, "But you still don't have a way to kill Belzenlok without the Chain Veil, right?" 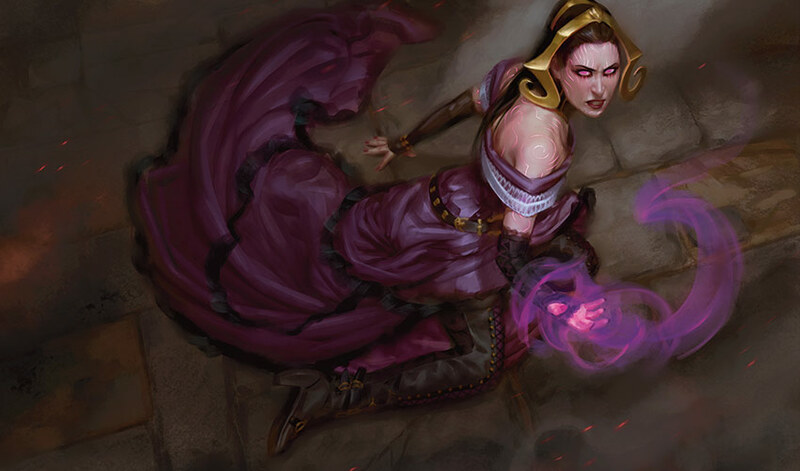 "He didn't tell you about the Blackblade," Liliana said, with an irritated glance at him. 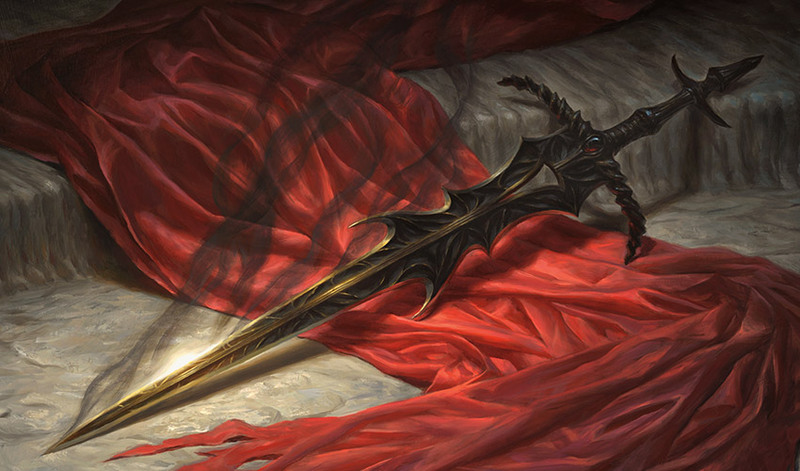 "It's a sword that slew an elder dragon, and Gideon is too delicate to allow us to use it." Chandra looked at Gideon, who said pointedly, "It's also a soul-drinker." Chandra winced, but said, "He is a demon, Gideon. We've seen what a demon can do to a plane." "Exactly," Liliana said. Jaya just looked thoughtful, her chin propped on her hand, but she didn't voice any disagreement. Gideon hesitated. He didn't want to argue with them, not when they had found Chandra again and were talking over their plan like sensible people. They had allies, a strategy, everything they needed to kill Belzenlok, except the weapon to do it. He said, "I can't—"
A thump of displaced air made him flinch, then with a sudden blaze of blue light, someone else stood in the compartment. Gideon shoved out of his chair and grabbed for his sword. Jaya was already on her feet, Liliana threw herself back against the wall and lifted her hands to cast a spell, and Chandra vaulted on top of the table, fire already crackling around her hair. Then Gideon froze, recognizing the aether trail almost before he recognized the newcomer's face. "Jace!" The door to the compartment was flung open, and Teferi, Jhoira, and Shanna stood there, spells and weapons ready, with Arvad, Karn, and Raff running up behind them. "Stop, it's all right! He's a friend!" Gideon shouted. Teferi flexed his fingers and stepped back, clearly not pleased to be startled. "He should knock first, next time." Shanna called over her shoulder, "It's all right, Tiana!" Gideon turned to Jace, astounded. "How did you find us? You shouldn't have been able to planeswalk onto a moving vessel." "And where have you been?" Liliana added, looking him over incredulously. "Are you all right?" "Yes, what happened to your clothes?" Chandra wondered as she jumped off the table. Jace glanced around at them all, his expression serious. 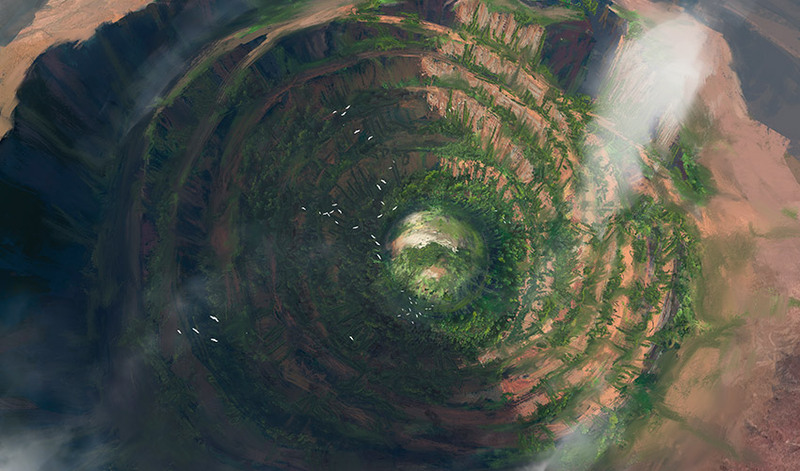 "This ship leaves a trace very like a Planeswalker's aether trail. Your aether trails in Dominaria were close enough to crossing it that I suspected you might have met up with it. I had to do some calculations to adjust for altitude and speed. It was tricky but manageable." The others were silent for a moment. Teferi lifted his brows and exchanged a look with Jhoira. Then Jaya asked, "Who's the bookworm in the bathing suit?" 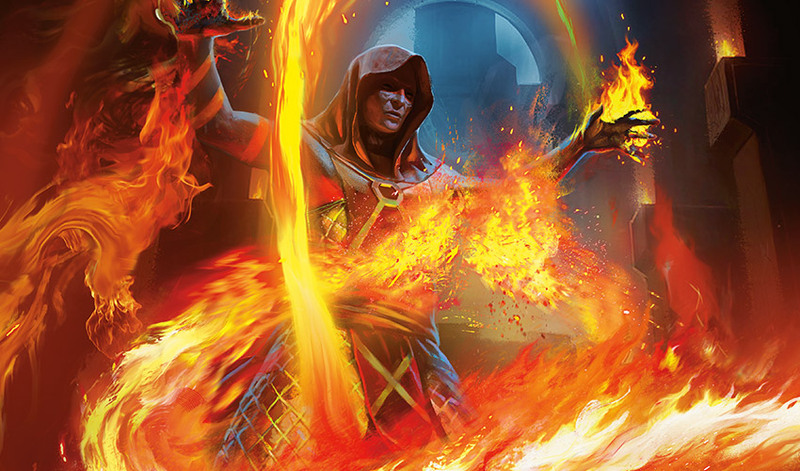 Gideon explained, "This is our friend Jace, another member of the Gatewatch." He gestured toward the others. "These are new allies. We've banded together to destroy Belzenlok." Distracted, Jace nodded to them. "I'm sorry to appear in your ship without warning, but my mission is urgent." He turned to Gideon. "I came here to warn you. Ajani wanted us to meet and regroup, but Bolas is preparing a trap for Planeswalkers." Gideon felt the sick inevitability of it. "A trap?" Jace's expression was grim and remained grim as he explained what he knew of Bolas's plan. Finally, he gestured urgently. "We have to go immediately—Ajani and the others will need all the help they can get." Behind Jhoira, Raff whispered, "He wants them to go to where the trap is? Isn't that the same as being caught in the trap?" Shanna shushed him. "Will you and Chandra come with me?" Jace demanded. Liliana frowned. "What about me?" Gideon should have expected something like this. But he didn't feel their situation had changed. "If this is true, we need Liliana at her full power more than ever." Jace shook his head, frustrated. "You don't understand. You can't trust her." "Oh, yes he can!" Liliana protested, more baffled than angry. And barely any time ago I was thinking how calmly we were discussing our plans, Gideon thought wryly. Keeping his expression calm, he said, "I do trust her, Jace. We're committed to destroying Belzenlok, and we have everything we need to attack his Stronghold. It has to be done, and not just to free Liliana. He's close to taking over all of Dominaria." Jace said, "I agree Belzenlok has to be killed, but there's no time. You can come back here after we fight Bolas. I'll be free to help you then." "Jace, that won't work," Liliana said wearily. "With my powers weakened, I can't help you. Not fully. We'll end up routed again, or worse. Just like on Amonkhet, at Bolas's mercy." Jace ignored her. He said to Gideon, "You must know she's lying, Gideon. Or at least manipulating you, not telling you the full story. I need your help." Gideon knew Jace was sincere, but he had thought a great deal about their strategy, and he knew it was as sound as they could make it. "Jace, we have a plan, we have a commitment to our allies, and we are ready to kill Belzenlok. I have no intention of repeating my mistakes on Amonkhet. When I meet Bolas again, it will be with Liliana, a necromancer capable of destroying any undead force he means to use against us." Jace was obviously unhappy. He turned to Chandra. "Chandra, will you come with me?" Chandra looked back at Jaya, who watched them thoughtfully, then glanced up at Gideon. "My plan was . . . not as great as I thought, but I have a chance to get what I need now. To learn a bit more. About myself. I—I must see this through here." Jace let out his breath in resignation. He stepped back. As blue shadows rose up around him, he glanced at Liliana. "Don't be a fool, Gideon. Like I was." The shadows flew into a whirlwind and he was gone. There was a long moment of silence. Then Raff said, "Are all Planeswalkers like this?" Teferi cleared his throat, took Raff's arm, and turned him around, leading him away toward the bridge. "You should have seen us in the old days, much more exciting." The others followed, Jaya pausing to give Chandra an approving nod as they left Gideon and Chandra alone with Liliana. Liliana pulled out a chair and sat down, dropping her head into her hands. Gideon tried to think of something comforting to say, but everything he could think of sounded like an empty platitude. After a moment, Chandra propped her hip against the table and said, "So I guess we need to hurry." "She's right." Liliana looked up at Gideon. "You said we had everything we need to kill Belzenlok. Does that mean you'll agree to using the Blackblade?" Gideon hesitated. The blade was a soul-drinker. Not that Belzenlok had a soul to drink. But there was no time to waste looking for some other method. Delay meant endangering the other Planeswalkers Ajani had gathered, meant the Cabal gained more footholds on Dominaria, made it harder for Jhoira and Shanna and all the others fighting them to root them out. He said, "If we can find it in the Stronghold, I'll use it." He might have expected Liliana to look triumphant, or to gloat a little over his change of heart. But she just looked tired, and said, "Thank you. For this and . . ." She looked away, uncomfortable. "For . . . everything." Gideon smiled a little. From anyone else, it would have sounded grudging, but he knew how hard it was for Liliana to say those words. "You're welcome." Later, Teferi found Jhoira sitting alone on the bridge. He took a seat across from her and looked out the port. The sun was setting over the green forest of Yavimaya and they were nearing the coast. After a time, Jhoira said softly, "If I could, I would give you all the time you wanted to make this decision." "Time isn't the problem." Teferi smiled a little and glanced at her. "Time is never the problem." Her lips curved in answer. "For you." He looked at the sinking sun, where the distant sea was turning golden in the light. "Do your new friends know I fought Bolas before?" "No. 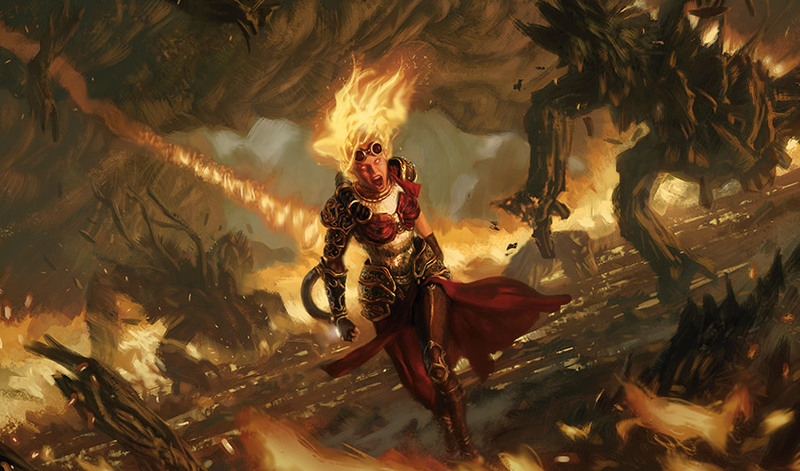 And when I decided to return your spark, I had no idea we would meet Planeswalkers locked in battle with him," Jhoira admitted. "This was not part of my plan." "Then perhaps it's fate, coming full circle." Teferi thought of a young man called Kwende, one of the many who had tried to kill him because of Zhalfir. 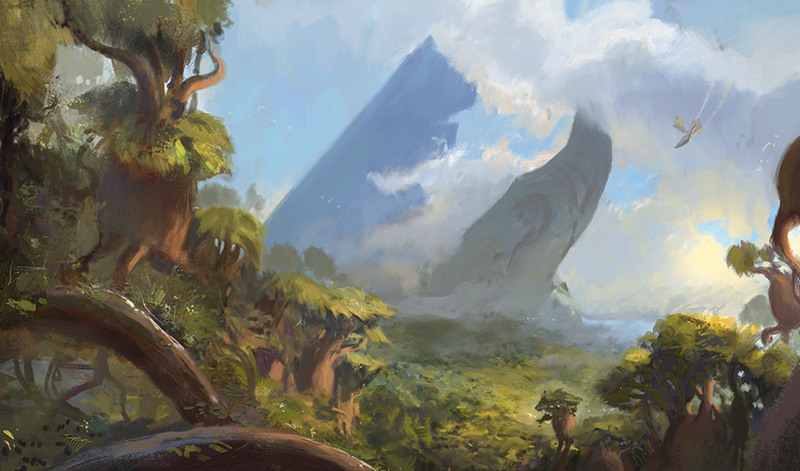 Kwende had been burdened by a need for revenge for the loss of a place he had never known, a place Teferi had only wanted to protect. Teferi had sworn to himself to return Zhalfir, to make amends for the hubris and certainty of his younger self. Denying the power that his spark would give him toward that goal would be as selfish as time-shifting Zhalfir had been in the first place. He sighed. And held out his hand. Jhoira smiled faintly. "I don't know what the future holds, and this might be a moment we both regret later. But this is a weapon you should have." She pulled the pendant off her neck and dropped it into Teferi's waiting palm. "Welcome back."